Techstars applications are open and I'm constantly getting asked the same question over and over: "How do I get into Techstars?" 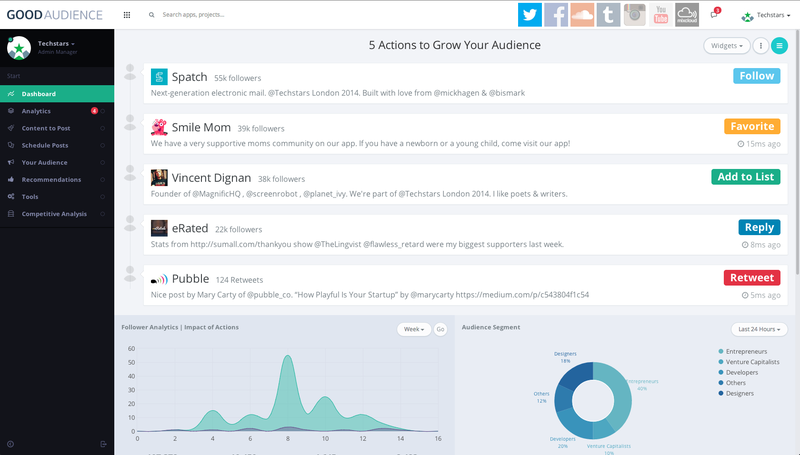 In hindsight, I can clearly see the exact path that got our startup, Good Audience, into Techstars London 2014. There were over 1,500 applications and only 11 companies accepted into the program. That's less than a 1% acceptance rate. I know what you're thinking, "I probably won't get in." However, I urge you not to play the percentages; the best thing to do is make your startup look as good as possible on paper. There are endless configurations of founders and Techstars has seen them all. In your application, it's important to show that your team can pull off the startup. Do you have several years of industry experience in your space? State it. Have you scaled systems? Show that you can do it technically. Can you hustle to break through obstacles? Share an impressive story. Karl and I doing customer development. Knowing how different businesses use social media is crucial. How are you different from your competitors? Investors tend to shy away if your market is crowded and if theres nothing that separates you from everyone else. This could be tough depending on what stage your company is in. You may not already have figured it out yet. The important thing to know is what specific problem you are trying to address and how people are solving it? 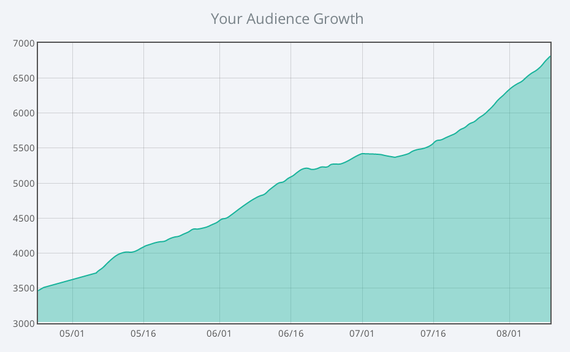 For us, it was simply that the mechanics of social engagement to grow your audience worked. Techstars believed that we could easily become the SEO Moz for social media; completely different from all the other social media platforms out there. All active users have a graph that go up and to the right. It just works. How big is the opportunity you're attacking? Does the market exist? If it does, how can you capture enough of it? For example, there are over 25 million businesses who use social media. If we captured just 1% of the market, charging $100/month, we'd be a $300M/year business. Do you already have users? Paying customers? In what time frame? This is your chance to show how well you have been executing. Be sure to have a target metric and try to hit it every single week. 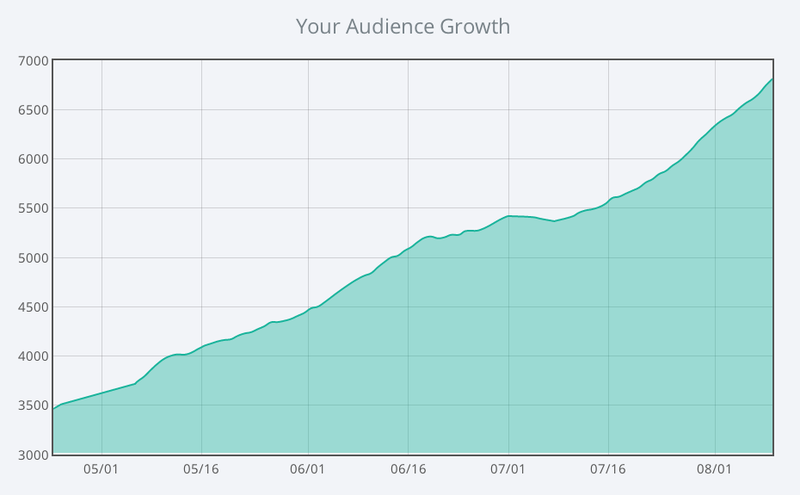 At the time we applied to Techstars, the product we were working on had been growing in new users at 51% a week. Even if someone doesn't fully understand the product or market, traction will trump that. Interviews happen over Skype, Google Hangout, and even in-person. The whole goal of the interview process is to see if they like you and how well you execute. I'm giving the interviewers a high five over Skype. 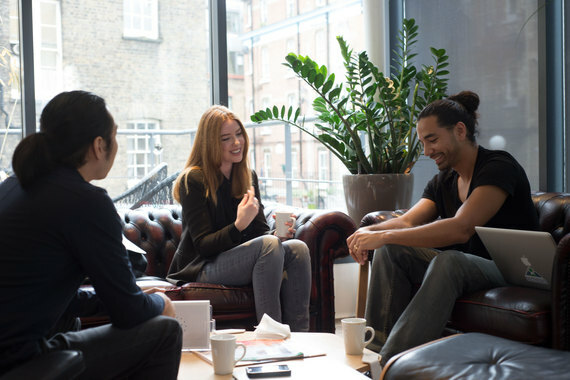 There are multiple rounds of interviews and they all gauge two things: can the team clearly explain their business and can the team get a lot done? You should be showing progress every single time you interview. 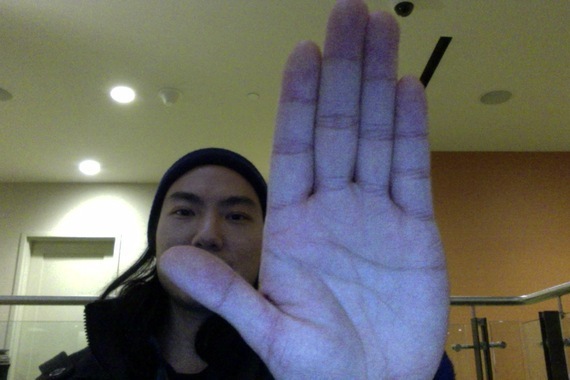 Each time we talked to the team at Techstars, we got an amazing amount of things done. We won the goodaudience.com domain in an auction for $79, acquired more paying customers, integrated more social media services, and received term sheets from competing accelerators. Techstars spend a lot of time recruiting to ensure the best teams apply. One strong signal is a direct recommendation of your team to the managing director of the program you're interested in. Have a look through your network to see who may be able to help make an introduction. One of our mentors introduced us to Cody Simms, the managing director of the Techstars Disney Accelerator. He was kind enough to take the time to meet our team over lunch and gave us tactical advice on how to move the business forward. Luckily, he liked us and sent a note over to Jon Bradford who is the managing director of the London program. On day one of Techstars, we were told that at least one team wouldn't make it through together to Demo Day. I didn't think that would be us, but it was. One week into the program, a co-founder abused our trust in a very bad way. So I had to terminate them from the company and inform the Techstars London directors of what happened. They were not pleased, to say the least. Our business at the time received terrible feedback during the first mentor week. Nobody could understand how it would scale. To top it off, my wife was pregnant; about to give birth, and I would have to fly back to San Francisco at any given moment. We were at a serious low. Given the situation at hand, Jon Bradford suggested two paths to take. We could accept that sometimes life plays us a bum hand and call it quits. Or we could clean things up. They would stand behind and support us, but we would be on a week to week probation and need to start demonstrating significant forward momentum. From an outside perspective, our team looked like a mess and the business was a pile of crap. Later that day, Mick Hagen from Spatch (another Techstars London team) saw that my body language was off. He sent me an email that inspired me to fight hard. I could have easily given up, walked away from the mess I created and returned the money. Mick and I took a walk around Clerkenwell, the neighborhood where our office was located. I told him everything that happened and he had my back. He wasn't going to let Good Audience leave. Our CTO Karl, was on a flight to join us in London and didn't know about being asked to call it quits. He was going to show up at the office at 4pm and we were going to have a meeting with the directors that would determine our fate. Mick suggested that I better go find Karl and make sure we're on the same page. It was about 2pm, I rushed on a double decker bus to his flat as he just checked in, and filled him in about our current situation. It was comforting that Karl never seemed nervous at all, he was confident we'd get through it and had my back too. Fortunately, the meeting with the directors went well. We stated our case and were granted life. There was no way we were going to simply give up and they completely supported us in that decision. As entrepreneurs themselves, they didn't want to be the ones that pulled the plug on our startup. We had one week before the next mentor sessions to get our act together. They applied some pressure to ensure we got back on the right track. In one week, we were able to clean things up legally, and create a prototype that described a compelling vision of the business we would pursue. We took what we learned from the previous business, threw away the product and created something for a different market based on feedback. A prototype and a vision can go a long way. All the Techstars directors and the mentors were excited about it. We looked like a completely different company. They were happy with how we handled the situation and we were going to stay. Jens Lapinski recently told me at that time, the directors took us off their list of companies to worry about. After that initial (almost catastrophic) disaster, we never made it back on that list. They whipped us into shape and I wouldn't have changed anything about the journey. 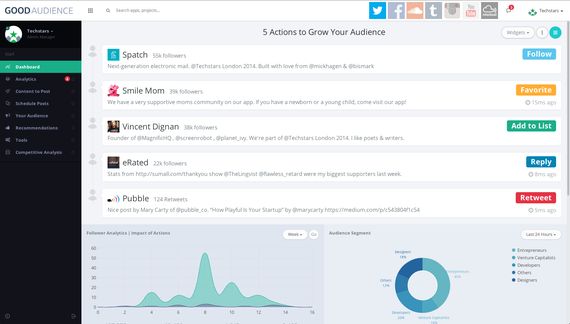 The people of Techstars London 2014. 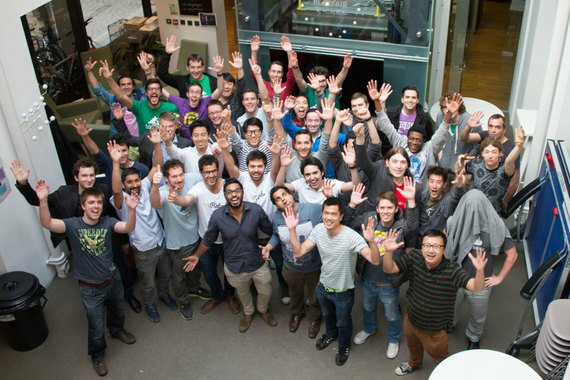 Founders, employees, hackstars, associates and directors. You must be able to handle change well. You have to be willing to throw things away when they're not working. You must be fearless in getting feedback and internalize if your product isn't something your users want. The team at Spatch were building their app on top of IMAP. After a couple of months, they realized that building hack on hack on top of email wasn't working. They scrapped it. You have to get a lot done, fast. Decisions must be made quickly. They may not always be the right decisions, but you must be able to quickly recognize that you're wrong and fix it. Your main focus is doing the best possible thing for your company on any given week. Our friends at Shortcut were blazingly fast. 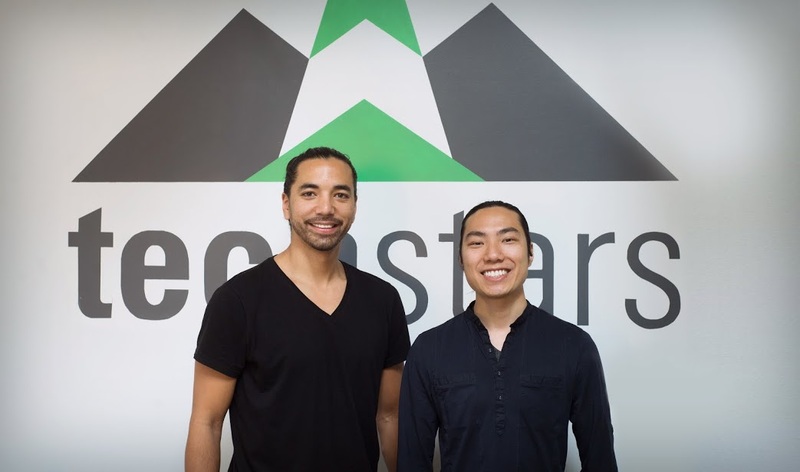 They came into Techstars with just an idea and pulled through by relentlessly cold calling venue operators, iterating multiple versions of their mobile app, and servicing several live events before demo day. In fact, they went straight from demo day to do another live event. Never give up. As a founder, it's up to you to keep the momentum going. There will be endless tough challenges that will test you mentally and emotionally. All you have to do is get through them. Smile Mom was notoriously hard working. I think they worked 90 days straight without taking a break. They maintained a 10% weekly growth rate every single week. When they were tired, they pounded another redbull and pushed through. Every single person involved with Techstars has the mentality of #GiveFirst. The community has no bad actors. It is a trusted network that feels just like a family. People are always there to help when you need it. Tak Lo, a director, was a shining example of this in London. He was the first person that stepped up to help when we almost got kicked out. He supported us emotionally and kept pushing us to fight. And for that I am forever grateful. To conclude, your goal is to be a strong team working on an interesting problem in a big market. I know it's difficult to explain that succinctly and I'm happy to help. If you are thinking about doing Techstars, want help with your application or advice on your interviews, you can tweet me @SHERM8N or send me an email here. Sherman Lee is the co-founder and CEO of Good Audience -- a SaaS that allows you to build, manage and market to your social communities in a fraction of the time. He writes about startups, marketing and entrepreneurship.